Hawke's Bay’s position as the Cycling Capital of New Zealand has been further recognised by three nominations at this year’s ASB Cycle Friendly Awards, being held in Wellington tomorrow, Friday October 29. Hastings District Council has been nominated for the ViaStrada Cycle Friendly Commitment by a Public Organisation for the promotion of Hawke’s Bay as the Walking and Cycling Capital of New Zealand. Hastings Mayor Lawrence Yule says the nomination recognises the considerable momentum that’s been building over recent years to make Hawke’s Bay the Walking and Cycling Capital of New Zealand through local commitment and innovation. "It really started with the Napier Rotary Pathways but has since grown to include a whole range of activities including the planned New Zealand Cycle Trail through the Tuki Tuki valley, the Walking and Cycling Model Communities project which will make biking and walking in Hastings a much more compelling choice and, of course, the work that’s gone into making Hawke’s Bay a centre of excellence for elite cyclists through the bid to build New Zealand’s second velodrome." "It's great for Hastings and the region to receive this national recognition." "Because we are able to offer such a wide range of world-class cycling related activities, as well as our fantastic climate, there is a great opportunity to attract more visitors, both domestic and international, to the region. Being recognised nationally as the Walking and Cycling Capital of New Zealand will further support these efforts," Mayor Yule says. 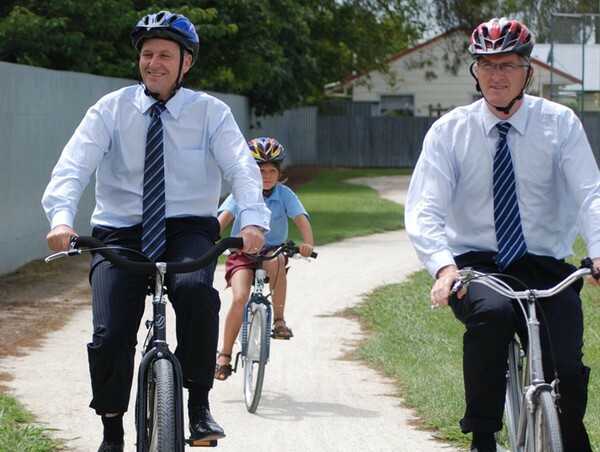 Bikes in Schools, a project launched at St Mary’s School in Hastings by Prime Minister John Key in February, has been nominated for the Avanti Best Cycle Facility Project. The Trust has worked tirelessly on a range of Hastings-based projects such as Police on Bikes, launched in Flaxmere and the Teenagers Bike On (TBO) project at Hastings Girls High School. Mr Mcardle says says it’s commitment from individuals and groups, like Bike On, in collaboration with organisations, like Hastings District Council, that will see people choosing to bike and walk more and thereby making a difference to their health, our environment and how we interact as a society. “It’s great to see Hawke’s Bay so well represented, with three nominations,” Mr Mcardle says.